How to Submit Revised Bid/Offer for M&P Tenders in IREPS? 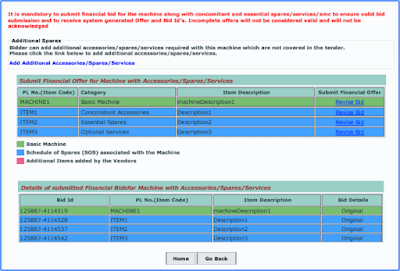 You can submit revised offer for a machine, for which you have already submitted the financial bid. You can revise your offer any time before the closing date/time of tender. In the case of revision, you will not go to change the submitted rates actually, you will submit a new bid for that item and your previous submitted bid (original bid) will be superceded and will not be considered for ranking. You can also revise the submitted revised bids. 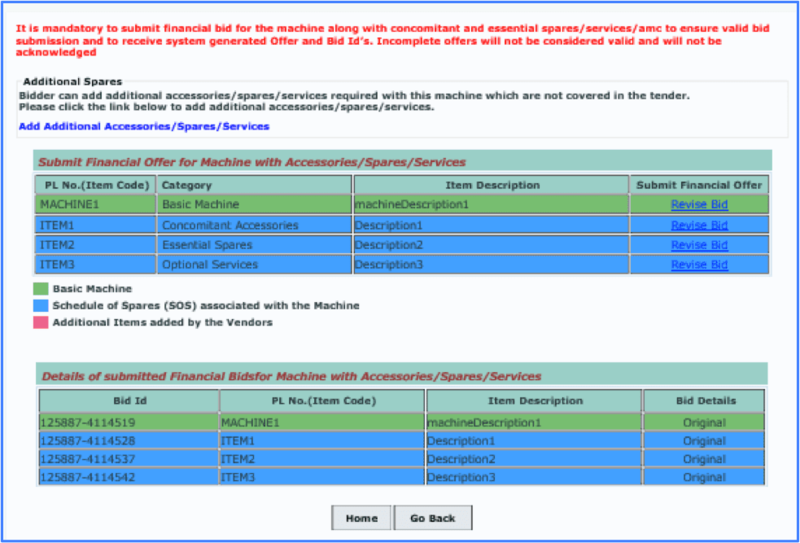 In M&P tenders, you can submit the revised bids for Basic Machine, Accessories, Spares, Services and AMC. First, log into IREPS application and then search the tender in which you want to submit the financial bids. For more details about tender search Click Here. You can also go to your inbox folder My Tenders (Not Yet Closed) to search the tender. Click on 'Bid Process' icon to proceed further for submission of revised offers. Go to 'Financial Offer' tab and click on 'Revise Offer' link against the Machine/Consignee for which you want to submit the revised offer. This page will show you the details of the machine along with Concomitant Accessories, Essential Spares, Essential Services, Optional Accessories, Optional Spares, Optional Services and AMC. You will get the Revise Bid link against the items for which you have been submitted the financial bids. Click on 'Revise Bid' link to open financial rate page for revised bid. Read the alert message and click on OK button. Rate page will be opened for the item for which you are going to submit the revised offer. Fill the rate details and click on Submit Offer button. After successful submission of the revised financial bid, you will get the Offer ID along with Bid ID, Offer ID will be same as the offer id of the previously submitted bids. Because offer ID for a Machine/Consignee remains same for all the Concomitant Accessories, Essential Spares, Essential Services, Optional Accessories, Optional Spares, Optional Services and AMC along with the basic machine. You can see the details of the revised financial bids under Details of Submitted Finacial Bids table, under bid details column you will get the Original for first bid and Revised for revised bids. You may submit the more than one revised bid for a Basic Machine, Concomitant Accessories, Essential Spares, Essential Services, Optional Accessories, Optional Spares, Optional Services and AMC. You may also submit the revised bids for the Additional Accessories/Spares/Services, which you have been added yourself to the machine. Click on Go Back button to go to Financial Bid Details page. You may submit the revised bids any time before the closing date/time of tender. Once Financial Bids submitted in the IREPS system you can not modify them but you can submit the Revised Offer or Alternate Offer for that machine/consignee anytime before closing date/time of the tender. How to Submit Financial Bids for M&P Tenders in IREPS? How to Submit Alternate Offer for M&P Tenders in IREPS?